This small detector will prove very useful to find studs in plasterboard walls. And you will also be able to determine the position of studs made of non-magnetic material such as wood. To find a metal stud behind the plasterboard wall move the detector across the face of the wall. As soon as you move the detector across the position of the metal stud the magnet enclosed in cap face shifts audibly in the direction of the wall. 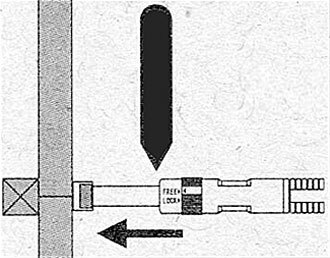 To locate non-magnetic studs, eg, made of wood, you need to activate a needle that is housed in the body of the detector by turning the white arrow on the knurled screw from the LOCK to FREE (illustration left). After using the needle return the knurled screw to the LOCK position (risk of injury). Now the front portion is free to move and will move back into the housing when it encounters a stud. The needle can easily pierce plasterboard where there is no stud. There is noticeable resistance if the plasterboard is backed by a stud. 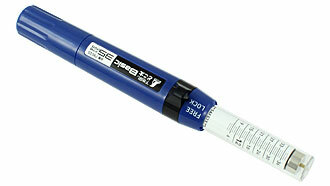 Supplied with two replacement needles. 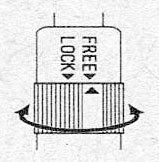 To replace the needle, unscrew the cap at the end of the housing (illustration top left). Make sure the knurled screw is set to FREE. 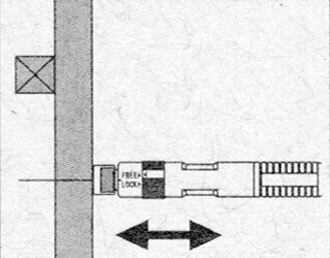 Pull the two-part needle holder apart, remove the needle (bottom left in Bild) and replace it by one of the two needles from the depot (illustration bottom right). Then push the needle holder back into place and screw down again.